The sixth FIFA Women's World Cup was held from 26 June to 17 July 2011 in Germany. Sixteen teams took part in this competition held at 9 different venues all around Germany. Japan won the final against the United States on penalty shoot-out, and became the first Asian team to win a FIFA World Cup. 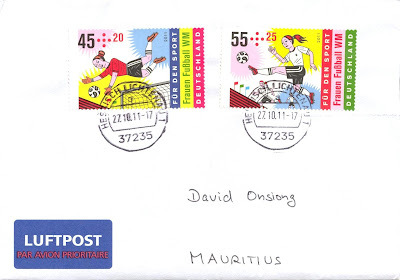 To mark this event, Deutsche Post issued on April 17, 2011 two stamps of 45 and 55 cents. The stamps were designed by Henning Wagenbreth and form part of the 2011 edition of the yearly sports series.